Ideal for two-way sound reinforcement systems, keyboard, guitar combos. For all bass applications. Specifications: *Power handling: 200 watts RMS *VCdia: 1.5" *Le: 0.84 mH *Impedance: 8 ohms *Re: 5.88 ohms *Frequency range: 46-3,500 Hz *Magnet weight: 25 oz. 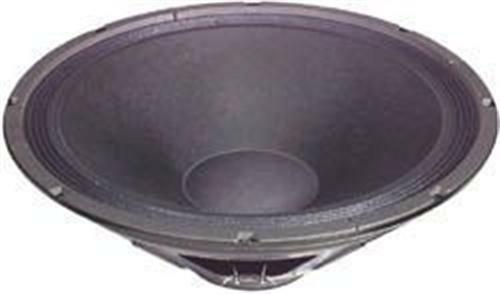 *Fs: 41 Hz *SPL: 97 dB 1W/1m *Vas: 9.2 cu. ft. *Qms: 7.23 *Qes: 1.53 *Qts: 1.26 *Xmax: 3.8 mm *Dimensions: Overall Diameter: 15.15", Hole Diameter: 13.77", Mounting Depth: 5.83". Xmax: 3.8 mm *Dimensions: Overall Diameter: 15.15", Hole Diameter: 13.77", Mounting Depth: 5.83".